The mini-ITX form factor is an important market segment for users looking to build a system with a smaller footprint, but without sacrificing on performance. ASRock's X99E-ITX/ac motherboard, launched several years ago, showed that HEDT performance and small form factor can work hand in hand. At the launch of Intel's Z390 chipset, a total of six mini-ITX models made its way onto retail shelves at multiple price points. 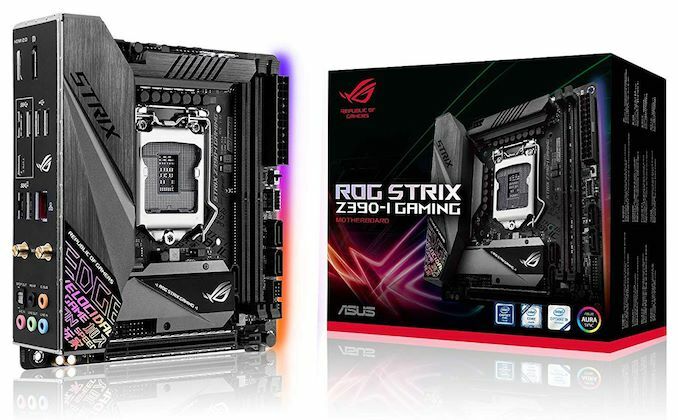 Two notable entries include the ASUS ROG Strix Z390-I Gaming ($210) and ASRock Z390 Phantom Gaming-ITX/ac ($190), both with premium controller sets and good quality power deliveries. The notion that smaller form factors negate users from building high-end gaming systems and offer enthusiast-grade performs is long gone. 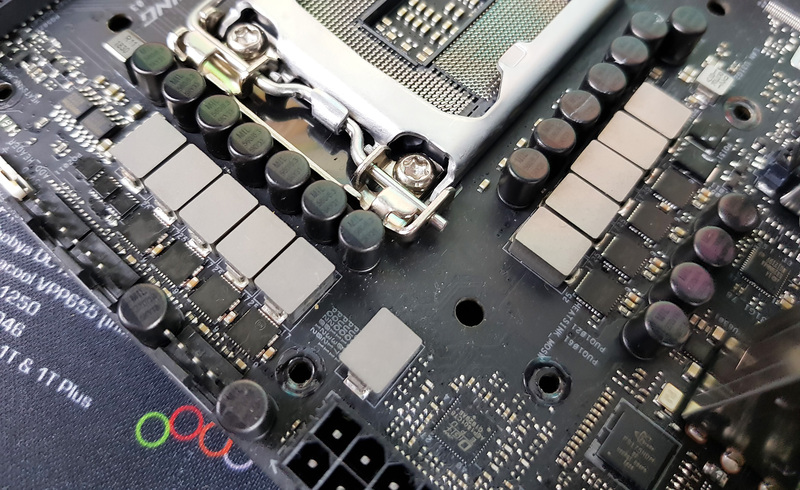 The ASUS board has our best ever overclock on a Z390 motherboard, along with support for 32GB DC memory modules. The ASRock board is the only Z390 motherboard with a built-in Thunderbolt 3 port. Both motherboards are extremely compeititive in all our benchmarks, even compared to larger ATX models. The details of the how and why these boards might be central to your next system build are in the following pages. Starting out with the ASUS ROG model, the Strix Z390-I Gaming is a mini-ITX sized motherboard with a slight resemblance to the previous ROG Strix Z370-I model. 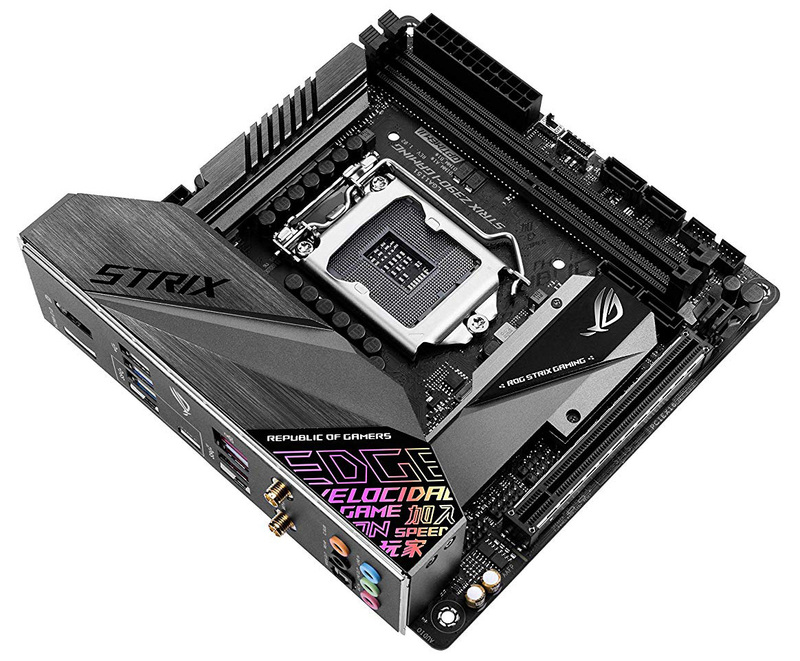 When a socket gets a refresh, it allows manufacturers to make positive changes to the newer models and the Strix Z390-I Gaming does have a few upgrades to note; both visually and in the specifications. The ASUS ROG Strix Z390-I includes a gaming-themed rear panel cover with integrated rear panel IO shield as well as RGB LEDs along the right underside of the board. Included for hot running NVMe SSDs is an M.2 heatsink which also covers the chipset, with a second M.2 slot located on the rear of the PCB. One of the biggest performance upgrades over the older model comes via the memory support, which is increased up to DDR4-4600. This makes the Z390-I Gaming one of the fastest advertised for memory from all the of the Z390 motherboards. One important aspect to note is that the Strix Z390-I is one of only three motherboards to include compatibility with the 32 GB G.Skill and ZADAKs Double Height DDR4 memory modules which we reviewed, and allows users to install up to 64 GB of system memory into a mini-ITX motherboard. Included in the controller set is a Realtek based ROG SupremeFX S1220A HD audio codec, an Intel I219-V Network controller, and an Intel 9560 Wave2 capable 802.11ac Wi-Fi adapter which also features Bluetooth 5.0. Along with just a handful of other Z390 models, the Strix Z390-I Gaming has HDMI 2.0 on the rear panel, as well as a single DisplayPort. 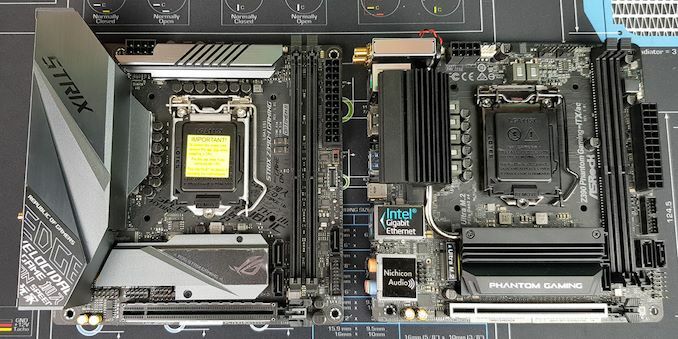 Touching on the performance, the ASUS ROG Strix Z390-I Gaming put in a good showing in our test suite with the fastest POST times of any Z370/Z390 board we've seen, with highly competitive results in most others. There weren't any pitfalls or anomalies shown, and the Strix Z390-I Gaming also put in a more than respectable effort in our overclock testing with our i7-8700K. We managed to achieve 5.1 GHz with a CPU VCore of 1.40 V, which was 100% stable - this is the first board in which that level of overclock has been stable. One thing we noticed was that ASUS seems to have a less aggressive approach to thermal throttling and this showed in our POV-Ray testing at the top end of our testing. Voltage control throughout was pretty tight and the boards AI Optimized profile worked very well with a 5.0 GHz overclock achieved at between 1.20 and 1.35 V measured with CPU-Z. ASUS ROG looks to have gone all-in features wise as it seems its crammed all the premium elements of its own ATX sized ROG Strix Z390-E Gaming model into a smaller package. With a current price of around $200 depending on the retailer, it seems to be a fair with what’s on offer and the level of performance. The ROG Strix-Z390-I is aimed at gamers and small form factor enthusiasts looking to build a high-performance mini-ITX based desktop PC; overclockers will be interested no doubt. 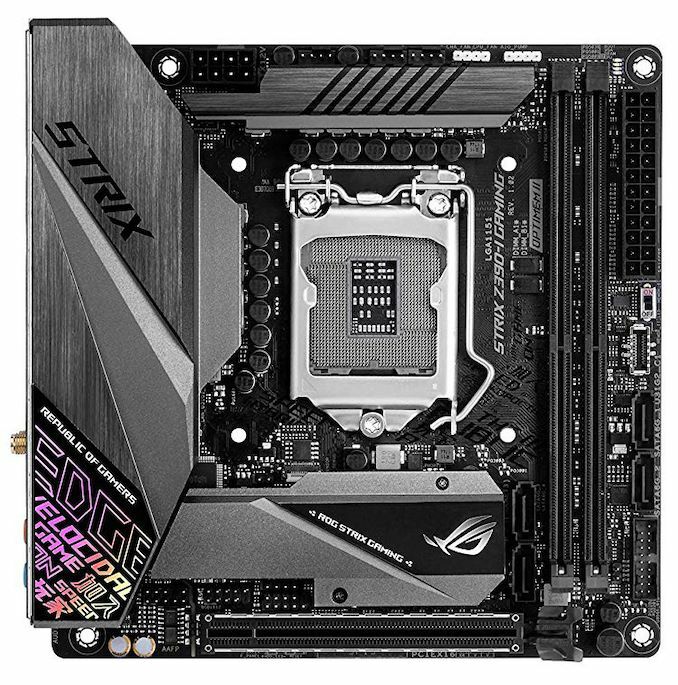 The ROG Strix Z390-I Gaming is ASUS’s only mini-ITX motherboard on the Z390 chipset and represents its gaming-focused Strix brand. The mini-ITX form factor does provide some limitations such as only having one single full-length PCIe 3.0 x16 slot, as well as only two memory slots. The rest of the feature set however is similar to the larger ROG Strix Z390-E Gaming, with the same ROG SupremeFX S1220A HD audio codec taking care of audio and an Intel pairing consisting of the I219-V 1 GbE NIC and 9560 802.11ac 2T2R handling the networking capabilities. On the rear panel is a little less USB 3.1 G2 USB connectivity than expected. Most boards in the upper echelon tend to include a minimum of four USB 3.1 G2 ports, while the smaller form factor of the Strix Z390-I Gaming offers just three G2 Type-A ports. The single USB Type-C included on the rear panel is USB 3.1 G1 and even though ASUS has included a USB 3.1 G2 Type-C header, it wouldn't be unacceptable to expect it to be implemented on the rear as standard. For users looking to use the onboard graphics capabilities on supported 8th and 9th generation Intel Core processors, HDMI 2.0a and DisplayPort are present. As it stands, this is one of only a handful of motherboards on the entire Z390 chipset to include HDMI 2.0. Looking at the design of ASUS ROG Strix Z390-I Gaming, it has a combined M.2 and chipset heatsink just above the armored full-length PCIe 3.0 x16 slot, similar to the previous ROG Strix Z370-I Gaming model. The newer Z390-I Gaming extends on the previous model's design with a full rear panel cover which includes the Strix branding at the top and holographic gaming inspired Edge sticker at the bottom. Another upgrade is the integrated rear panel IO shield. 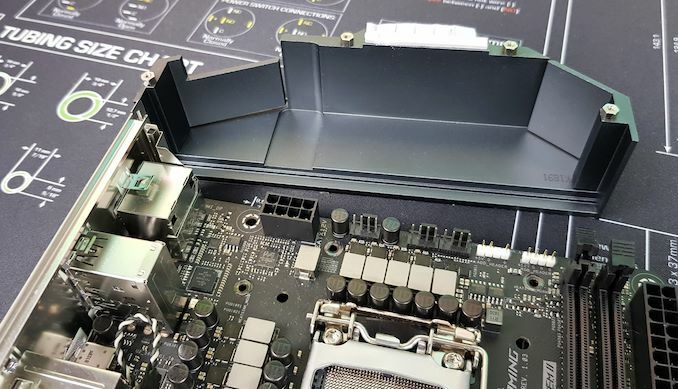 The metal rear panel cover which also doubles up as part of the power delivery heatsink, SoC power delivery heatsink, and the M.2 heatshield/chipset heatsink, All the heatsinks feature the metallic grey finish. The PCB itself is all-black and features some stylistic urban print resembling of the ROG Edge sticker on the rear panel cover. 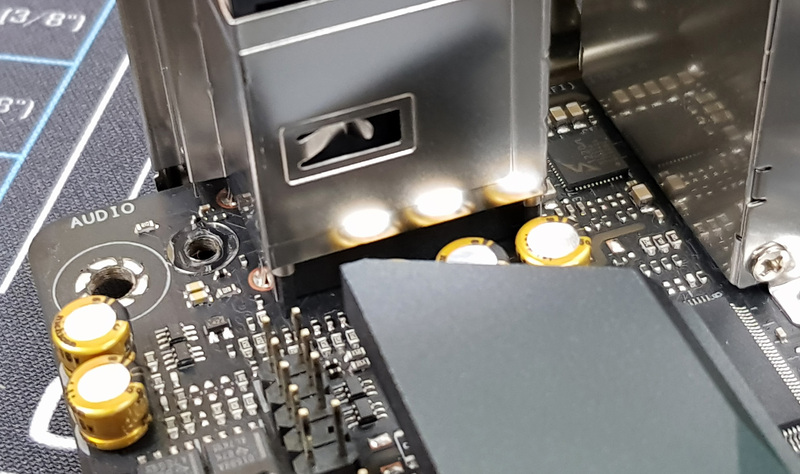 There is some RGB LED lighting integrated onto the board which emanates from the right-hand side of the board the back and ASUS has included a single RGB addressable and a standard RGB header for users to expand upon. The mini-ITX form factor does bring limitations due to the size. This is apparent with the two memory slots and a single full-length PCIe 3.0 x16 slot. The memory slots support dual-channel memory with speeds of up to DDR4-4600 and up to 64 GB in total. The ROG Strix Z390-I Gaming is one of three ASUS Z390 models to be compatible with the double height double capacity G.Skill TridentZ DC RGB and ZADAK Shield DC RGB 32 GB modules which we reviewed and makes it a desirable option for users wishing to put 64 GB into a mini-ITX board. Another direct consequence of limited space stretches to the headers with one USB 3.1 G1 and one USB 2.0 header present; both headers can support two ports on each. Also featured is a USB 3.1 G2 Type-C header. Another casualty of the small form factor is in the cooling support, as the Strix Z390-I has just three 4-pin headers available. These are divided into three sections at the top of the board; a CPU header, Pump/AIO header and a single header for system fans. On the storage front, the ASUS ROG Strix Z390-I Gaming has four straight-angled SATA ports which have support for RAID 0, 1, 5 and 10 arrays. On the front of the board is an M.2 PCIe 3.0 x4 slot which has the benefit of an included heatsink. The second slot is located on the rear of the board and has support for M.2 PCIe 3.0 x4 drives, with both slots offering support for M.2 2280 drives. It is worth noting that if an M.2 drive is installed into M.2_1 and is running in SATA mode, it automatically disables the SATA_2 port. ASUS has been quite tight-lipped about the power delivery configurations for its Z390 models prior to launch. For this board, we can see that ASUS uses what looks like a 6-phase design. The ASP1401CTB PWM controller regulates a total of six ON Semiconductor NCP302045 45 A DrMOS power stages and the VCore looks to be actually running in a three-phase configuration with two sets of three NCP302045 power stages connected together. ASUS hasn’t used doublers and is running the VCore phases in parallel. The ROG Strix Z390-I Gaming uses 5K solid capacitors and a has a total of eleven 60 A inductors. The VCCIO and VCCSA section of the power delivery also the ON NCP302045 45 A DrMOS power stages. It's a slightly misleading setup and for what should be a relatively straight forward configuration, it seems to be more a lot more complicated than it needs to be. The design of the power delivery heatsinks, and ASUS’s integration of the metal rear panel cover which doubles up as a heatsink, is quite an ingenious use of space. Not only does the rear panel omit plastic panels, but acts as a large surface for passive cooling and systems with high airflow could benefit. On the small heatsink, there isn’t much bulk or weight, but it seems more than capable of handling the SoC section of the power delivery. Sandwiched in between the rear panel audio ports and the Intel 9560 802.11ac Wave2 Wi-Fi adapter, is the cramped ROG SupremeFX S1220A HD audio codec. This is a rebranded Realtek ALC1220 HD codec which is found on most Z390 boards and is seemingly the standard for premium motherboards. The codec is surrounded by five gold Nichicon audio capacitors and the area does include physical PCB separation from the rest of the board; the S1220A codec itself isn’t isolated and doesn't include an EMI shield. 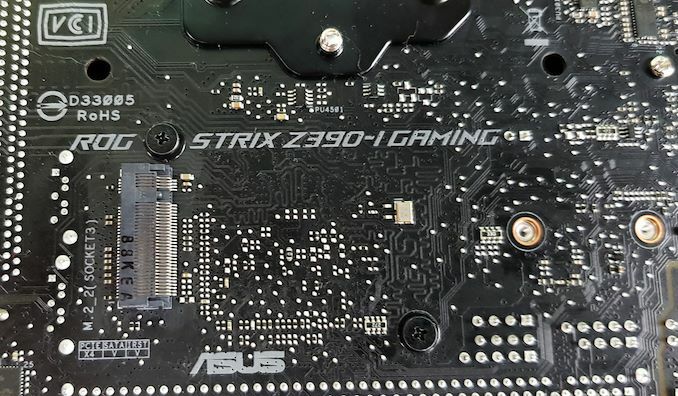 On the rear panel of the ASUS ROG Strix Z390-I Gaming is a preinstalled I/O shield which locks into place with the same screws that holds the rear panel cover in place. There is a varied selection of connections on offer with the USB connectivity being led by three USB 3.1 G2 Type-A and a single USB 3.1 G1 Type-C port. Other USB connections include two USB 3.1 G1 Type-A ports and two USB 2.0 ports which seems pretty weak for a board at this price point. Integrated graphics users can use the pair of video outputs which includes an HDMI 2.0a and DisplayPort 1.2 port. A total of five 3.5 mm colored audio jacks with a single S/PDIF optical output is handled by the SupremeFX S1220A HD audio codec, the single LAN port is powered by an Intel I219-V GbE NIC and two antenna ports is for the Intel 9560 802.11ac Wave2 Wi-Fi adapter which offers support for speeds of up to 1.73 Gbps; the Intel 9560 also offers Bluetooth 5.0 capability. 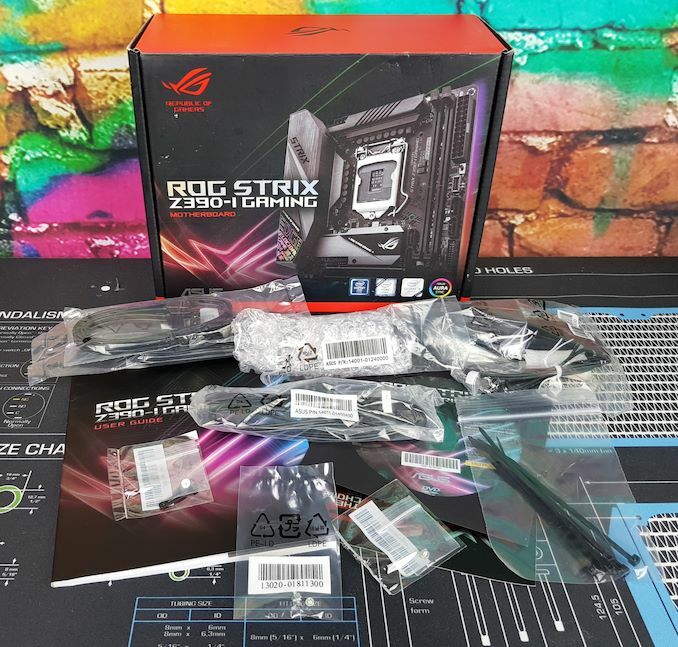 The ROG Strix Z390-I Gaming motherboard has a good selection of accessories including four SATA cables, black cable ties, and the 2T2R moving antenna required for using the boards 802.11ac Wi-Fi and Bluetooth 5.0. A nice touch is the inclusion of a 20% off voucher for Cablemods cable extensions and an 80 cm extension cable to help users better route RGB LED cables; good for helping to manage cables in tight spaces. asus and asrock are seperate companies, owned by different owners, ASrock, is owned by pegatron.